Critics and connoisseurs all agree that Auguste Clape is one of the greatest pioneers in winemaking of the Northern Rhône and that his Syrahs from the cru of Cornas are among the most celebrated wines of France and throughout the world. The Clapes farm only eight hectares on rough, steep terraced vineyards. All vineyard work must be done by hand and they work the old-fashioned way, by instinct, feeling, and common sense. The vineyards sit on granite subsoil, behind the village, with optimal sun exposure. They own pieces in prime sites and individual parcels are vinified separately in old, oval foudres. 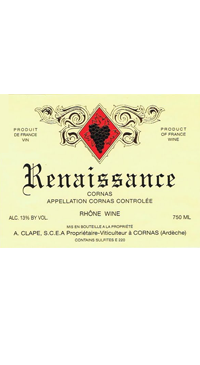 Long élévages of twelve to twenty-two months add depth to the natural complexity of the wines. The wines are capable of tremendous longevity in the cellar, although Kermit also encourages trying them while they are young and fresh, to better appreciate the evolution to come. For a taste of the old-style Syrah from the fabulous, sculptured slopes of the Northern Rhône, Auguste Clape’s Cornas is the only place to start. The grapes come from a 1.2 ha plot of 12-20 year old vines growing on granite soil. Whole grape clusters are fermented with natural yeasts in open air cement cuves with punch-downs or pump-overs twice a day over 12 days followed by malolactic fermentation in foudre. The wine then ages for 22 months in 6 or 12 hl-foudres.